"Of course, Viking conquests of England are nothing new." For Iceland's Reykjavik Grapevine newspaper, the result was not a big surprise. History was on their side. Throughout Euro 2016, the newspaper has provided coverage of Iceland's sparkling campaign, which is rivalled only by the breathless TV commentary of Gummi Ben. Even before a ball was kicked, Iceland was ready for "Brexit 2 - The Smiting". But elsewhere England's shock defeat to the tournament debutantes was greeted with a mixture of shock, sensationalism and not a little schadenfreude. Germany's Sueddeutsche Zeitung calls England's laboured attempts to gain control of the game a "testament to the helplessness of a team of the disillusioned". Der Spiegel is baffled by Roy Hodgson's approach to the game, and calls his resignation "his best decision of the day". For Spain's El Pais, England's plight was not a matter of tactics or team selection, but a product of a mindset built on past tournament failings. "A throw-in was enough to instil the doubt and everlasting stench of defeat that always accompanies England." Iceland will go on to face France in the quarter finals and the host nation's media are careful not to underestimate their opponents. "They are not afraid of anybody," says Le Monde, while Le Figaro warns the French team not to give in to complacency. "Les Bleus will have celebrated. But they hope one thing: not to become the next victims of these incredible football players who have come in from the cold." Few nations will have enjoyed the result as much as Wales. Popular website Wales Online posted on Facebook: "Nope, no sympathy." "Instead of revelling in England's loss, Wales should congratulate Iceland, another small country that's shown how to win at #EURO2016." In Russia, a country that endured an even worse Euro 2016 campaign, the focus is less on a humiliating defeat than a stunning victory. Sport Express asks: "How many exclamation marks are needed to reflect the emotions brought on by Iceland's victory?" SovSport notes that Iceland "draw strength from collectivism", adding: "In the north it is difficult to survive without esprit de corps. The 'Vikings' are patient and courageous at the same time - running, guns blazing, towards the enemy's gates just to test their mettle." "In contrast to English fans, the Icelandic supporters are extremely peace-loving, although overflowing with emotions. Experts say Iceland's victory is further proof that money does not play football." Naturally, most papers could not resist drawing parallels to last week's EU referendum. 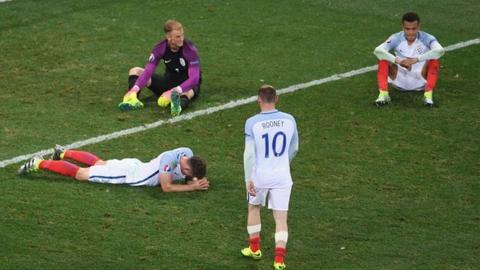 Switzerland's La Tribune de Geneve sas: "England woke up this morning with a terrible hangover for the second time in less than a week. This time it is not the vote of its people which is to blame, but its national team which has disappointed on all fronts." The result reverberated beyond Europe. Iran's Khabar Online calls the result "humiliating", and for South Africa's Daily Maverick, England were "a shambles". In Australia's Daily Telegraph, Martin Gibbes says: "To understand the true depth of England's defeat to Iceland you need every letter of the alphabet." Gibbes then goes on to list every letter: A for apologies, B for blunders, C for clueless... Y for yawn... and so on. But it was the Reykjavik Grapevine that provided the most insightful explanation for the result.